Catalina Island Jawseum exhibition set to fin in September! The world’s first ever museum exhibition celebrating the making of Jaws is set to end its successful run at the end of September. Since it opened its Jaws - I mean doors - to Jaws and film fans on April 21st in Catalina Island Museum, over 20,000 people have been devoured by the brilliant Jaws: The Art of Fear in Filmmaking, the first such exhibition of its kind. The unique display offers visitors a fantastic insight into the behind the scenes exploits of one of the most beloved and feared films of all time. The exhibition allows you to lose yourself in the work of Jaws Production Designer Joe Alves through his original storyboards, location scouting photos, behind the scenes pictures of cast and crew and not forgetting a mass of original props and ephemera from the film. You could almost be back in Martha’s Vineyard in 1974. And if that wasn’t enough you also get to ‘rub shoulders’ with Brody, Hooper and Quint thanks to the amazing hyper-realistic life-size model work of Greg Nicotero, winner of four Primetime Emmys and perhaps best known for his special effects make-up on The Walking Dead, Hostel, Scream and The Evil Dead II. 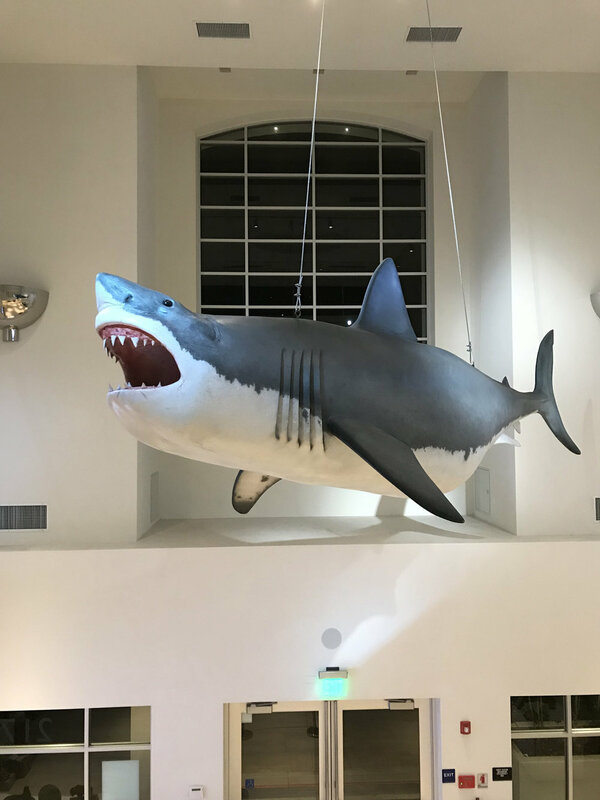 Catalina Island Museum’s Executive Director Julie Perlin Lee said: “As the first-ever exhibition documenting the making of JAWS, we are proud to celebrate those involved in its making and to be a part of its continued history. A whole new generation of fans has been introduced to this classic film through the exhibition. People from all over the world have enjoyed the exhibition and the catalog, Joe Alves on Designing JAWS, (sold exclusively through our museum) has been shipped to every continent, except Antarctica." There’s still chance to marvel at the Jaws exhibition before Bruce and his dorsal fin disappear beneath the waves, but as Hooper says “Don’t wait for me!”, as it ends on September 16th. Catch it whilst you can, just don’t try exchanging your holiday roast for tickets. And how is it best to get to the museum? By boat, of course.